You generally don’t see a lot of recipes for poached food on this site. The reason is because I am generally a slave to the crispy; if I had a child I’d name him Maillard… if my kid happened to be a French boy overly fond of browning reactions. Salmon and trout are different. To me, most poached fish always tastes thin, like spa food. But you can of course poach things in liquids other than broth or water. Like fat, or oil. Now we’re talking. If you’ve ever eaten butter-poached lobster — or really butter-poached anything — it will change your mind about poaching. 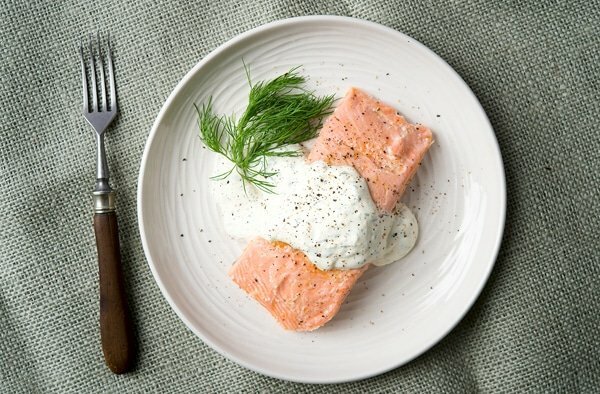 What you see here is a classic: King salmon, very gently cooked in sweet butter, served with a bangin’ sauce of sour cream, horseradish and dill. A little freshly cracked black pepper adds one more level of zip. It is so simple, but so damn good! You might notice that these portions of fish are big. As a point of fact they are almost a half pound each. Sounds like too much, right? Holly and I had zero trouble knocking it back. For some reason the silky salmon just seemed to go down so easily, and the sour cream mixture added all the outsized flavors we prefer. Oh, and you do need the freshly cracked black pepper: It adds needed texture. You will note that there are three methods of cooking the salmon in this recipe. I happen to have a sous vide water oven, which lets me set a precise temperature so I can cook things perfectly. They are an awesome tool to have, especially for a fish and game cook. That said, even an inexpensive one will run you $100 or so. Fortunately, most anglers and hunters also have a vacuum sealer, and you can seal up some salmon with a little butter and cook it in a big pot of hot water to basically do the same thing. Finally, there is the traditional method, which involves submerging the salmon in lots of butter (or oil) until it’s just barely cooked. I’ve poached salmon in all three ways and they’re all good. You’ll also notice a wide range of timing for the cooking. This hinges on a) how thick your salmon is, and b) how cooked you like your fish. If you are using farmed salmon, you can serve it very rare if you’d like. For wild salmon, I would only serve it rare-to-medium if the fish had been flash frozen first: This kills any possible parasites that can sometimes be in salmon. Raw wild salmon is mostly safe, but not always. For the record, I use king salmon and I like it cooked medium. This dish looks subtle, but it ain’t. You can butter poach virtually any other fish. Trout is an obvious alternative, but you could use just about any fish you can cut into blocks: Cod, halibut, grouper, cobia, shark, swordfish or sturgeon, a large striped bass, etc. Play around with it and see what you like best. Dissolve the salt in the water and brine the salmon in the refrigerator for 30 minutes to 1 hour, depending on how thick it is. Move the salmon to a cutting board and pat dry with paper towels. 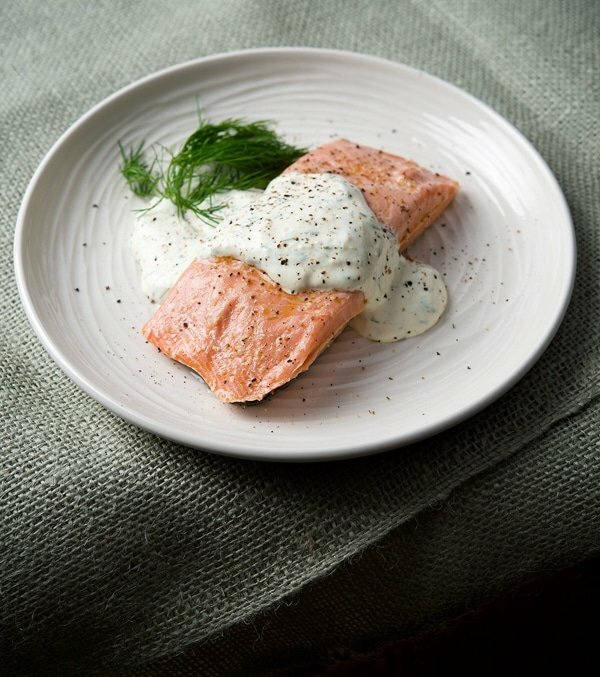 While the salmon is brining, mix together the sour cream, horseradish and dill in a bowl. If you have a vacuum sealer, seal each portion of salmon in its own bag -- if you jam them all together they won't cook as well -- each with at least 1 tablespoon of butter; you can use more if you'd like. If you don't have a vacuum sealer, melt the butter in a pot large enough to submerge at least 1 piece of salmon. Turn the oven on to "warm" and put a baking sheet inside; this is for the cooked pieces of salmon to rest while you do the others. Of course, you could also melt a pound or so of butter and poach all of the salmon at once, but that gets expensive. 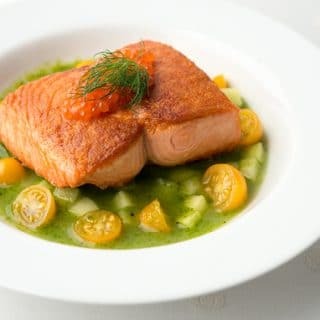 The easiest way to poach the salmon is to cook it sous vide for 20 to 45 minutes at 135°F -- the lower end of this spectrum will give you rare-on-the-inside salmon, the upper end will get you fully cooked but still luscious salmon. If you don't have a sous vide water oven., fill a large pot 3/4 full of water and heat it to the steaming point, about 150°F to 160°F. Don't let it simmer. Drop the vacuum-sealed salmon in the water, cover the pot and turn off the heat. Let them cook in the bags for 10 to 20 minutes. If you are doing the butter bath method, melt the butter over low heat. Place the salmon in the butter and let it cook gently for 10-20 minutes. Carefully lift it out with a spatula and move it to the preheated oven. 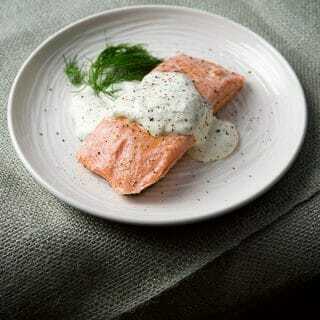 Once your salmon is poached, serve with a dollop of the sour cream and top with black pepper. Roasted or boiled potatoes are a good accompaniment. We tried this Sunday with fresh splake and it was amazing! Used the vacuum bag method. I’ve done this one twice now. Once with splake and once with brown trout. Both from Lake Superior. When we did the brown trout we added ramps sauteed in butter to the poaching bags before sealing and cooking. Amazing! I told a friend about it and he tried it with olive oil in the bags since his daughter had a dairy allergy. He and his 2 daughters all raved about it. The texture of the fish is amazingly tender.